Sometimes when you’re in the midst of a ghoulish Halloween celebration, a little comic relief is just what you need. Enter Park City’s Howl-o-Ween parade, set for Wednesday, October 31, 2018. It’s one of our favorite local celebrations here at Jensen and Company. At 5 p.m., leashed and costumed canines of every ilk will lead their owners along Main Street to Heber Avenue, showing off their doggy disguises. The annual pup promenade immediately follows the time when Main Street becomes an emporium of sweets, with shops handing out candy to trick-or-treating kids from 3 to 5 p.m.
Do you want to join the four-legged fray? You’ve got your dog, so you’re halfway there. But what should your pet sport during the Howl-o-Ween parade? We’ve some great ideas that will win your pet the admiration of parade spectators. 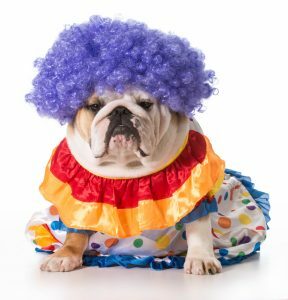 Your dog may not tolerate having a squeaky red nose affixed to their snout, but you can make them circus-festive with a crazy clown wig and an outfit enlivened by polka-dots and ruffles. That’s even more reason for your bulldog, husky or chihuahua to clown it up during the Howl-o-Ween parade. With the help of your furry friend, you can help reclaim the fun factor of the clown. “Where’s my good boy? Where’s my good boy?” That’s what you’ll be saying when your dog is transformed into a transparently cute ghost for Halloween. 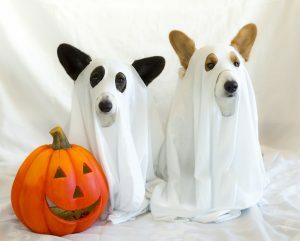 You can pick up a doggie ghost costume online or at a Halloween shop. It might be easier and quicker to make this get-up the same way you made your own last-minute rig the year you forgot to plan for Halloween. You just need to drape your pooch in a sheet, or perhaps a pillowcase for smaller breeds, with holes cut out for the eyes. Oh yeah, and don’t forget to snip a bit more fabric to let those adorable ears peek out. And why not make yourself a matching spectral costume? 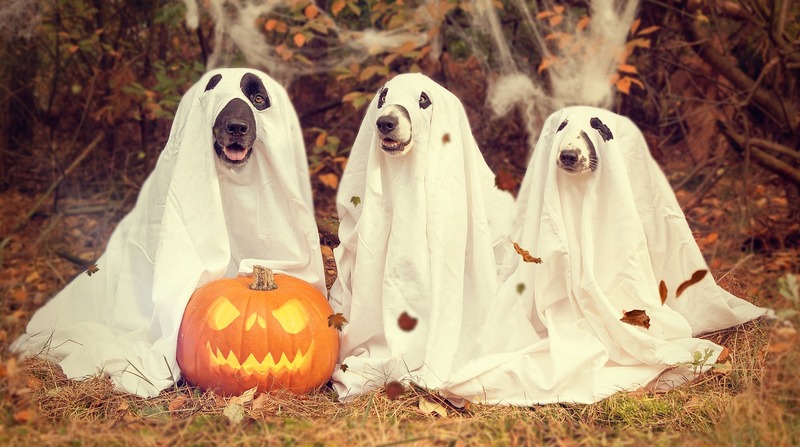 With you and your dog thusly draped, your Halloween promenade will be a real-life Ghost Adventure! Dogs already have a bit of magic about them. They use their wiles instead of wands, tricking you into pampering them with cute poses and hangdog expressions. 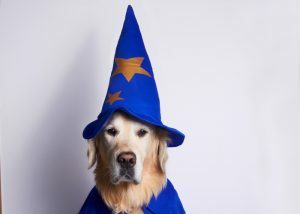 With this in mind, a wizard costume is the perfect choice of Halloween garb for your precious pet. They just need a pointy hat, bedazzled with some cosmic designs, and a cloak. The best thing about having your dog join the wizarding world is that, should they get their invitation to Hogwarts, there’s very little uncertainty as to which house they’ll be sorted into. Your huffing and puffing pug is the perfect candidate for Hufflepuff. Your whippet will likely skulk into Slytherin. You clever Rottweiler is clearly a Ravenclaw. And your golden-hearted golden retriever is aimed straight for Gryffindor. If you want your pet to look ship-shape, we’ve got the perfect dog costume for you. 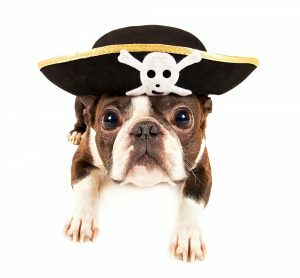 Dress your pooch as a pirate and you’ll have a pillaging party on your hands. All you need is a pirate hat small enough to fit your pup’s noggin, preferably emblazoned with the skull-and-crossbones motif warning foes they’re headed for a one-way trip to “Davy Jones’ Locker.” If you’ve got an easygoing dog (BarkPost.com has named Labradors as the most tolerant breed) you can also have them wear an eye patch for that weathered look. 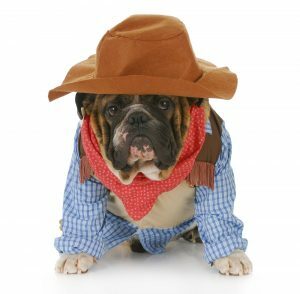 Even if you’ve got a dog whose breed hails from afar—an English bulldog, perhaps, or a Chinese Chow Chow—you can still provide them with a Halloween costume celebrating an all-American archetype. Would you like to spend every holiday in beautiful Park City? You can trust Park City realtor Jensen and Company to help you find the property of your dreams.